The only option is "click to reconcile", but I want it to just dismiss the notification and keep using my home local time the way I can on Google Calendar etc. If you select that option, the notification should vanish until you change timezones again (but you'll remain in your home timezone). Do you not see that option? I can't immediately reproduce this. The toast popup says "click to reconcile", but I don't *want* to reconcile them, I want them to remain different. So I didn't even end up in the dialog, which I didn't know existed. 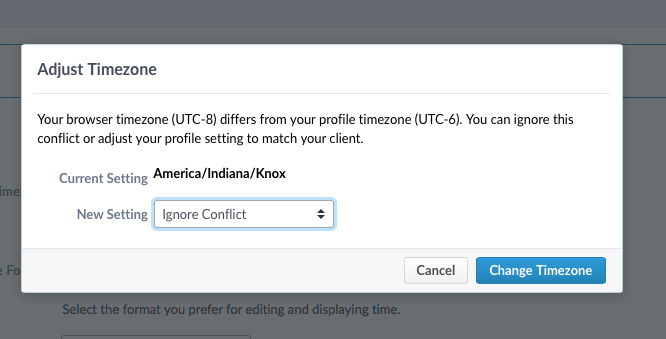 if I must go into the dialog, I expect a third button that says "Ignore Conflict" alongside "Cancel" and "Change Timezone"
I also got confused numerous times by having to click a "Change Timezone" button in order to NOT change my timezone setting (as I had chosen to "Ignore Conflict"). Laptop (and therefore web browser) uses PST. Tell Phab to use UTC. Daylight Saving Time begins. Laptop switches to PDT. Tell Phab to use UTC again. Travel to another timezone. Laptop switches to the local timezone. Go home. Laptop switches to the local timezone. Travel again. Laptop switches to the local timezone. Daylight Saving Time ends. Laptop switches to PST. That's broken. It's annoying. It's actually stupid behavior. All this nagging about timezones should not be happening, and it very especially should not be happening if your Phab settings are UTC. Tell Phab to use UTC. Phab never, ever asks me anything about timezones again. If that's not available, then could we at least set appropriate user expectations by changing the label? 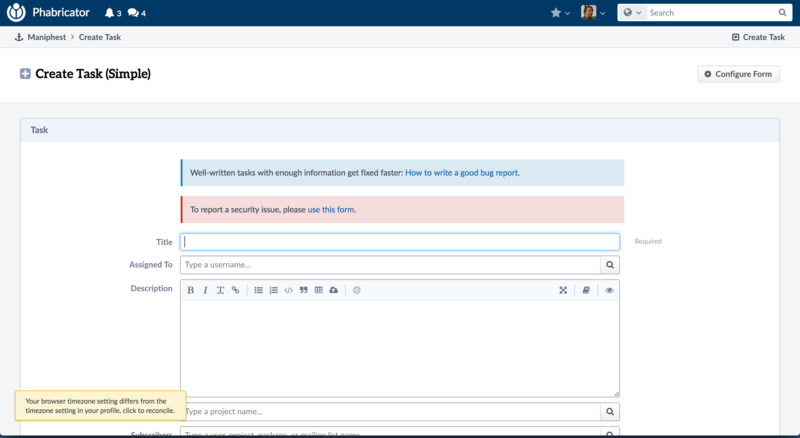 It shouldn't say "Ignore Conflict" when the plan is to keep hassling the user. It could instead say "Temporarily ignore conflict, until the next time your browser time changes".